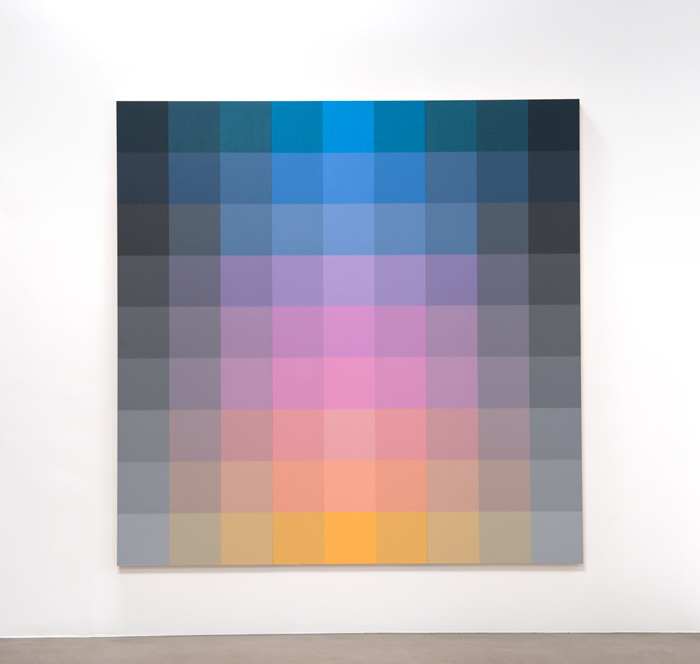 Robert Swain's paintings are difficult to categorize. His intense engagement with color gives him an affinity with the Impressionists and their heirs. Yet the gridded clarity of his color patterns recalls Minimalists geometry. Just as Carl Andre arranged twelve by twelve inch metal plates in floor pieces he called "carpets," so Swain assembled the paintings in this exhibition from birch panels of the same dimensions. Of course, each of Swain's panels is covered with acrylic paint ina hue adjusted with exquisite precision to the surrounding hues -- and to the overall pattern of the painting of which it forms an indispensable part. With vision caught up in the sensuous yet stately flow of color across the surface of the painting, thoughts of Minimalist grids and boxes evaporate. Despite his use of geometric structure, Swain could be seen as an anit-Minimalist. But that is too narrow a view of his achievement. By foucsing so directly on color, Swain has challenged assumptions basic to Western cultures's view of reality. Writing in the 5th century B.C., the Greek philosopher Anaxagoras stated that matter is prior to color. In his cosmology, as in others from the period, color was contingent, a quality added to material form by the quirks of human vision. This distinction between essential form and inessential color persisted over the centuries, affecting not only science but also art. Thus line and tonal modeling predominated in Renaissance painting, where color seres as form's embellishment--though the high-keyed palette of Titian, Tintoretto, and other Venetians of the Renaissance provided some resisteance to the authority of linear form. Nonetheless, it was not until the mid-19th century that Claude Monet and the other Impressionists dared to make images from the play of sheer color. What the Impressionists achieved intuitively, the Neo-Impressionists--Georges Seurat and Paul Serusier among them--subjected to systematic analysis. They were guided in part by the writings of a chemist named Michel Eugene Chevreul, a figure Swain mentions in one of his statements. Invoking Chevreul's Law of Simulaneous Contrast, Swain notes that when red and green are juxtaposed "the contrast is heightened." He adds that our experience of the contrast originates in "the energy generated by the convergence of [the] unique spectral wavelengths" of these colors. 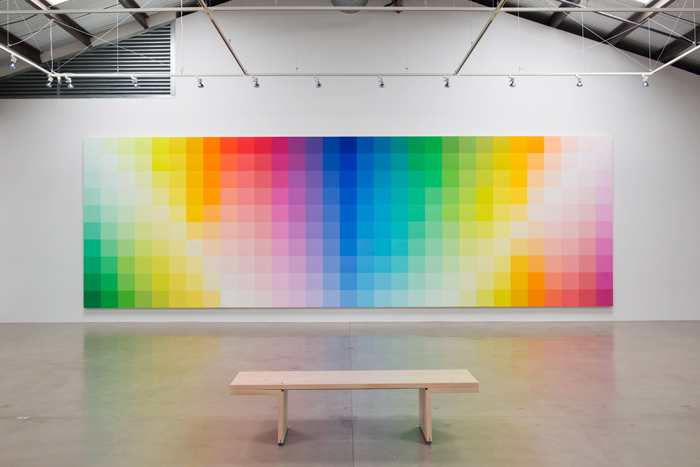 Over the decades, Swain has organized 4,896 hues into a vast system. 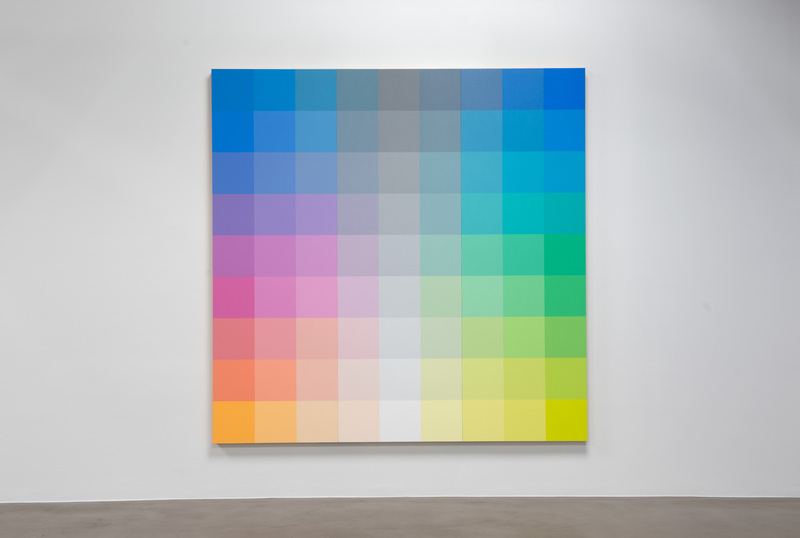 To make a painting, he selects a range of colors and deploys them in gradated sequences. 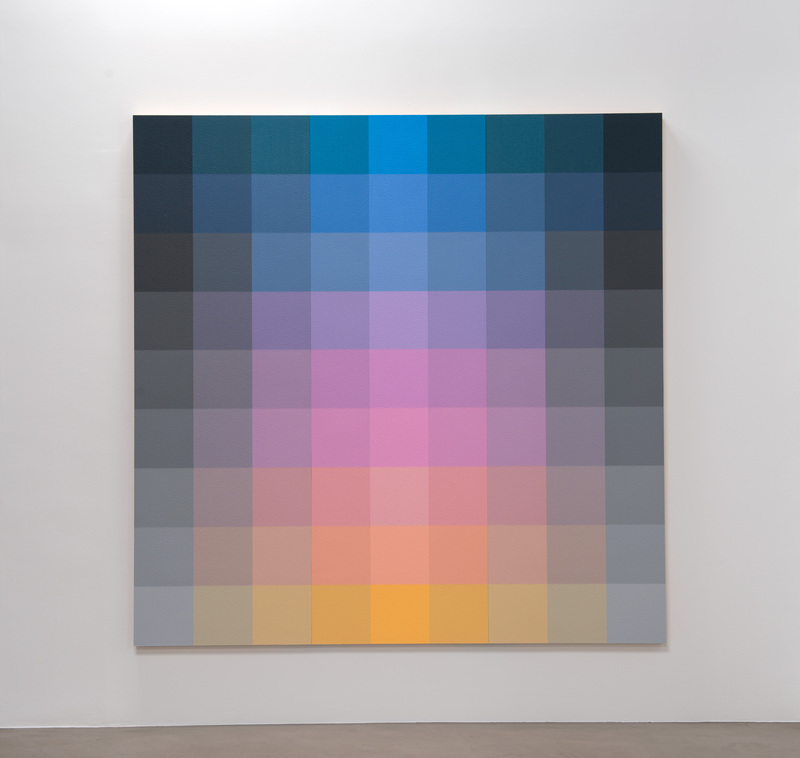 Following a row of color-blocks across the surface we watch as, steb by subtle step, a cool color becomes warm. A low-keyed color becomes bright. Degrees of saturation--color intesnsity--modulate. 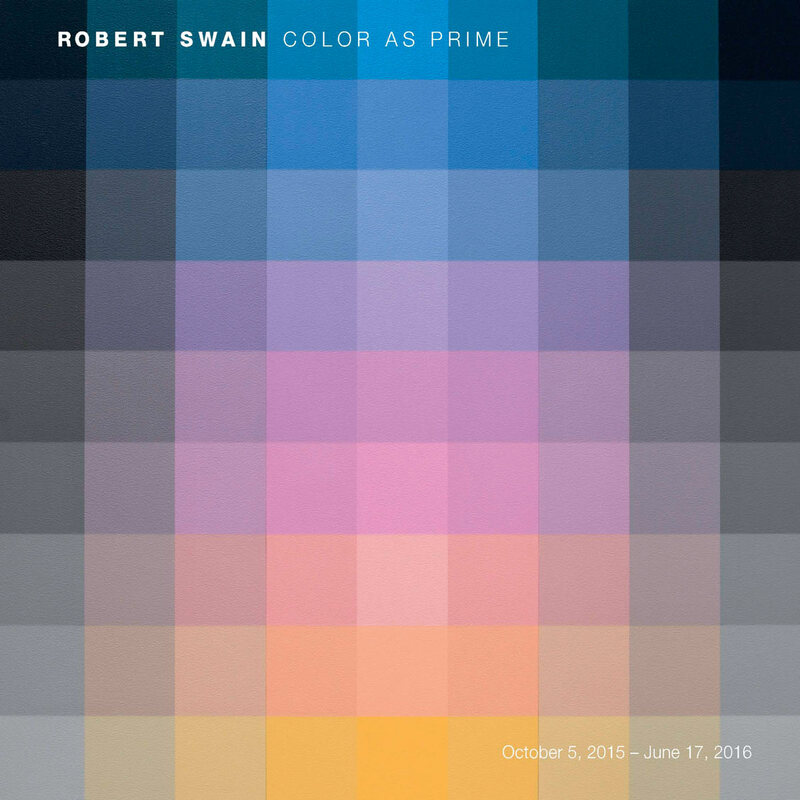 Interweaving these shifts in hue, brightness, and saturation, Swain brings the surface to life. Felix Feneon, a leading proponent of the Neo-Impressionists, noted that their "brushstrokes are the outcome, not of swift dashes of the brush, but of the application of minute dots." From a distance, these dots merge into colors more luminous than any created by mixing paints on the palette. And an image of some recognizable subject appears. By expanding the Neo-Impressionist dot to a twelve by twelve inch surface, Swain ensures that we will focus on color itself. For there can be no figures, no horizons or skies, in his paintings. So we call him an abstract artist, yet this doesn't seem quite right. For he has not abstracted--or extracted--his imagery from some prior source. His colors have an aura of primacy. The ancient cosmologists posited certain forms as elemental. Swain persuades us to imagine that color came first, that its sensuous power is the origin of all that exists. 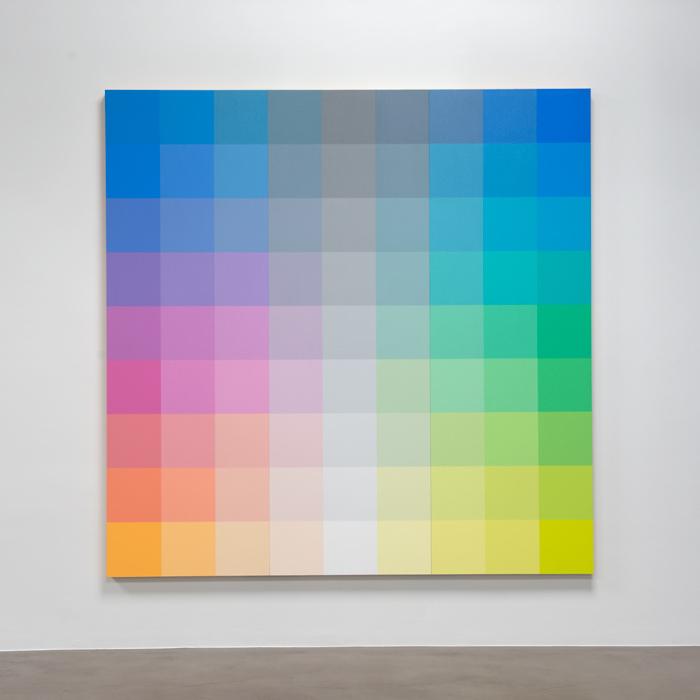 Form emerges as a means of ordering and intensifying the effects of color. Turning to the largest painting in this exhibition, we see an immense surface bisected by a column of blue. Comparatively high-keyed at the bottom, the column deepens in tone and sautration as it ascends. Grandly flickering patterns of near-white ascend in opposite directions--but identical angles--from the midpoint of the painting does mirror the left, though Swain has inverted the pattern so that, for example, the dark green in the lower left-hand corner reappears on the right along the upper edge. With adjustments like these, he charges the painting with currents at once elusive and powerful. We are swept along, immersed in a feeling of plenitude. Swain gives us, through color, a sense of the fullness of being.